We’d love your help. 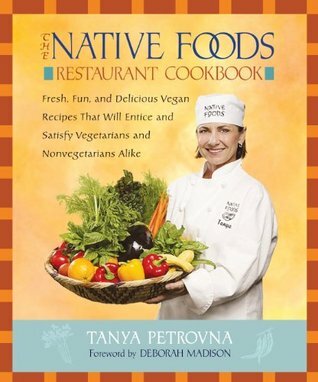 Let us know what’s wrong with this preview of The Native Foods Restaurant Cookbook by Tanya Petrovna. To ask other readers questions about The Native Foods Restaurant Cookbook, please sign up. C I wasn't really into many of these recipes; they seem to be heavily reliant on fake meat subsititues (seitan, tempeh, tofu), which I do like but don't have in every single meat. Most of them also seem to require a bunch of steps or complicated ingredients. Needless to say, I won't be making anything from here. Native Foods is one of my favorite SoCal vegan restaurants and this cookbook provides recipes for many of their popular dishes along with some surprisingly good additions. The recipes are pretty easy, not too elaborate, and require little to no modification (but are easily adjustable to your own personal tastes). Also includes a decent recipe for homemade seitan! If you are a vegetarian, this is the book for you. The Native Foods Restaurant Cookbook is chock full of authentic looking very vegetarian recipes that introduce new palates to items like tempeh, soy protein, grains, tofu, etc. This is a great resource. Thanks for reading my book reviews. leave it to LA to create more than one restaurant/cookbook combo that i can't live without (real food daily being the other one i am mentioning). super yum.